Magnuson Hotels, the world’s largest independent hotel group, announced today the complete rebranding of a Brunswick, GA Best Western as the Magnuson Hotel Brunswick Inn. The 144-room former Best Western of over 30 years seeks to elevate its local, regional and national market position with the Magnuson Hotels brand designation. Butch Gearhart, owner of Magnuson Hotel Brunswick Inn is a hotelier of over 30 years and no stranger to franchise affiliation. “The current economic climate in our area forced us to scrutinize all of our expenditures, including the expense related to the branding of our property. In searching franchise options, Magnuson Hotels repeatedly showed up in various reports and reviews as the most effective in delivering reservations at the lowest cost. After speaking with numerous former Best Western owners and managers, we set our sights on Magnuson Hotels as a viable and positive option for our property,” stated Gearhart. Magnuson Hotel Brunswick Inn is just minutes from numerous natural wonders including Historic Downtown Brunswick, Saint Simons Island, Fort Federica National Park, Jekyll Island with Summer Waves Water Park, Okefenokee Swamp National Park and Hofwyl-Broadfield Plantation State Park. Guests will enjoy continental breakfast, free wireless Internet, an outdoor pool, onsite restaurant and lounge and conference facilities. “The Magnuson Hotel Brunswick Inn is a welcome addition to our group of nearly 2,000 independently owned and operated hotels. We are committed to helping Mr. Gearhart combat the tough economic times through increased visibility so that he and his employees can profitably provide the most exceptional guest experience,” stated Thomas Magnuson, CEO. The Magnuson Hotel Brunswick Inn will receive total brand representation across North America and the UK, without the costs and requirements of franchise brand affiliation. In contrast to traditional hotel chains that charge a percentage of total hotel revenue, the Magnuson Hotel Brunswick Inn will increase its net income with higher market exposure at a lower cost. All direct revenue to the hotel is non-commissionable and royalty free. 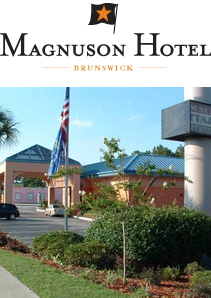 The Magnuson Hotel Brunswick Inn is backed by the quality standards of the world’s largest independent hotel group. The hotel will also receive a 10% brand rebate, paid every six months.